Cyclists are blowing tubes along the Westlake Avenue North Cycle Track. Bike-shop owners say the culprit is small, black tacks. They wonder if someone deliberately sprinkled the tacks there. 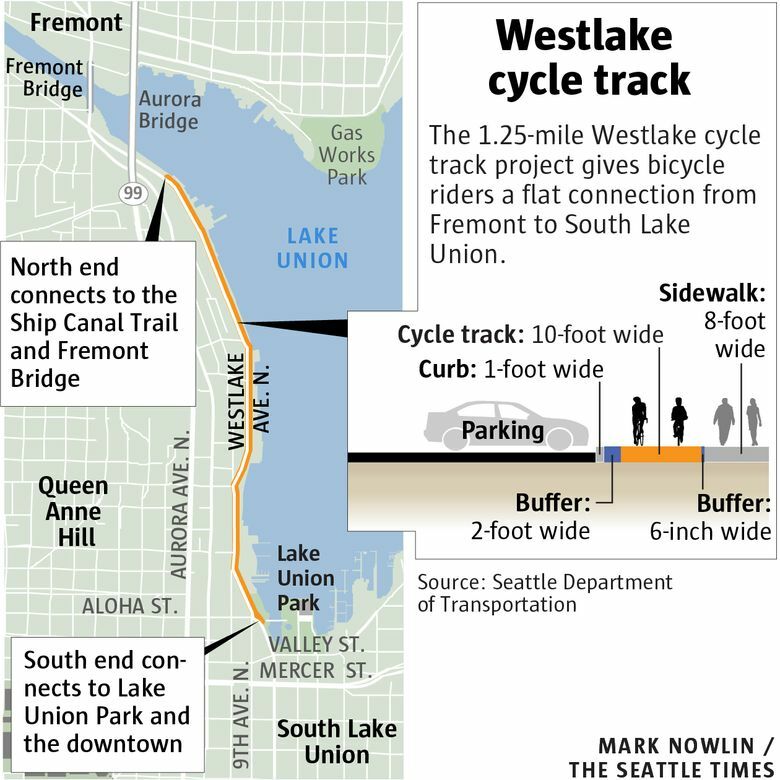 For seasoned cyclists during Seattle’s construction boom, a nail in a tire isn’t all that uncommon. 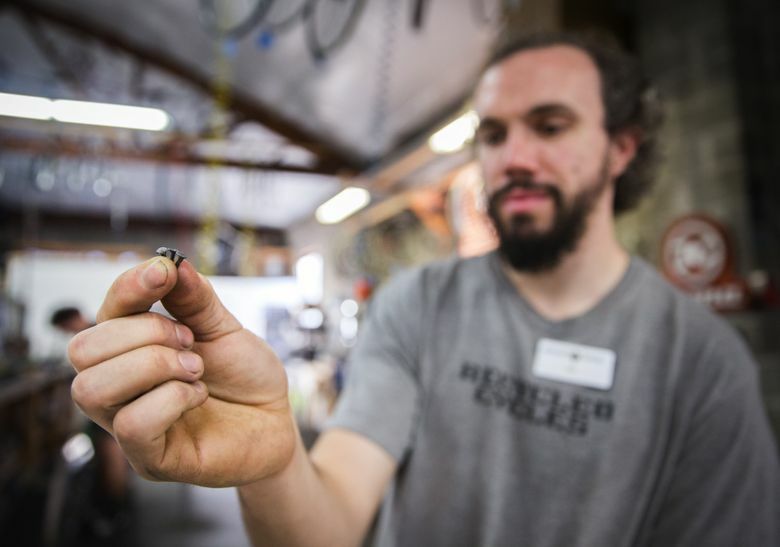 “We repair flats all day, every day,” said Max Rogan-Goddard, assistant manager of sales at Recycled Cycle’s Fremont location. He estimates the shop services about 10 blown tubes each day. Rogan-Goddard took notice, however, when the same culprit was to blame for about five flats a day. Employees became suspicious, he said. “They’re too short and not constructed well enough to be used as a construction-grade fastener,” he said. 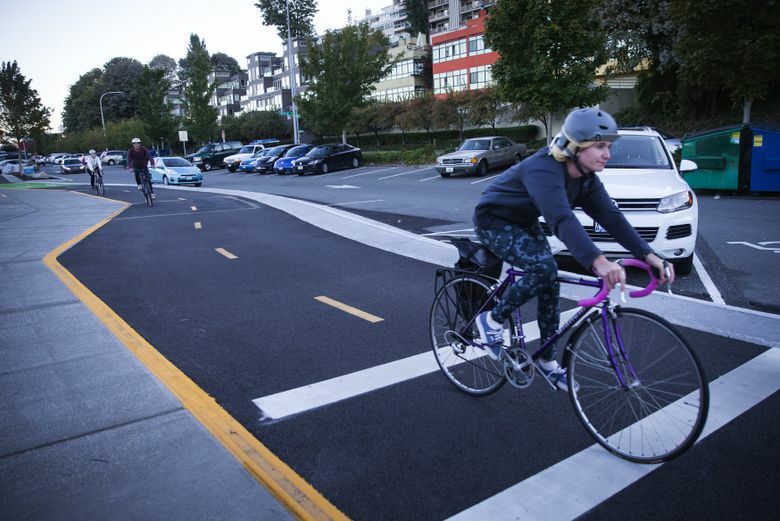 Plus, the riders who reported the tacks were traveling on the same route: the just-opened Westlake Avenue North Cycle Track. “We started to wonder if someone was scattering them intentionally,” he said. Other bike stores near the new cycle track, which runs from the Fremont Bridge to Lake Union park, said they’ve seen issues, too. 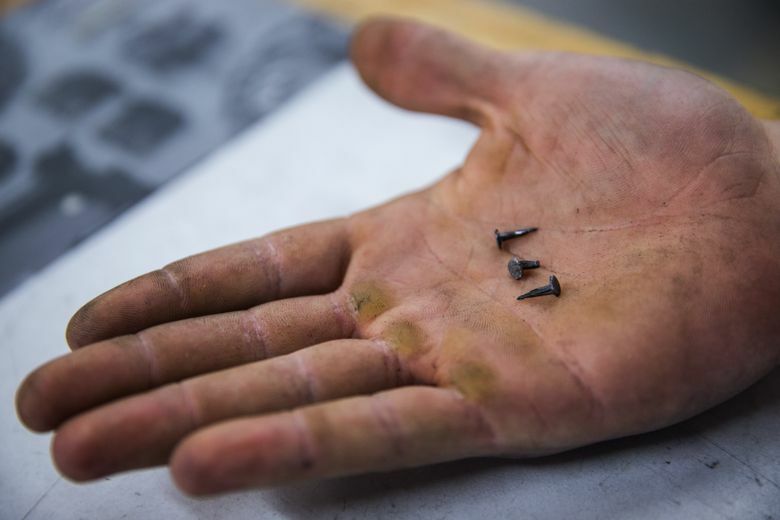 Buck Hazard, co-owner of WRENCH bicycle workshop in South Lake Union, said he pulled six tacks from tires over the past week. Jesse Angelo, the owner of MBR Bike Shop downtown, said about 20 people have come in. 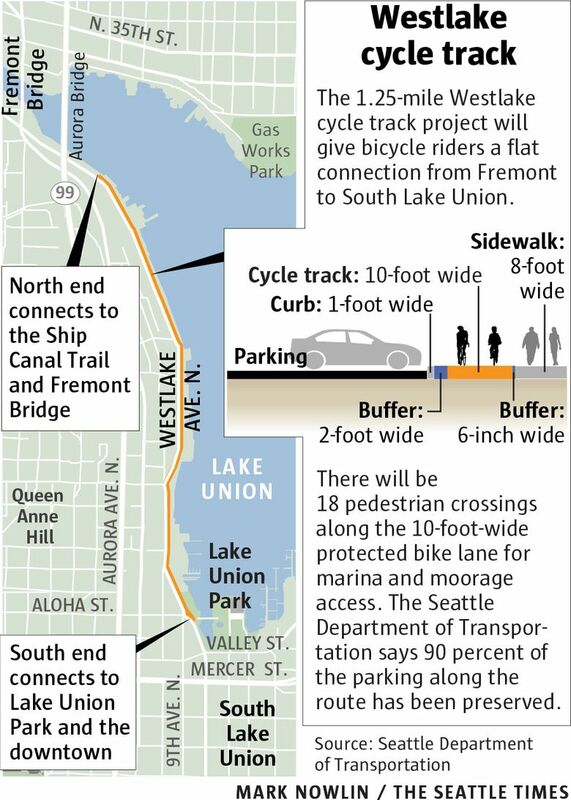 The Seattle Department of Transportation on Thursday afternoon sent a street-maintenance team to travel the length of the cycle track and check surrounding areas for tacks. The team found some tacks with a magnetic roller on the Westlake Avenue North cycle track and in surrounding areas. The department also contacted Seattle Police to look into the matter. Hard to say, Rogan-Goddard said. Angelo said the black tacks are just the right color to be camouflaged by the black surface of the cycle tracks. “It’s really hard to see those things,” he said. It feels deliberate. “Definitely, someone’s sprinkling them all over Westlake,” he said. It’s not uncommon for tacks to find their way into bike lanes. Last January, thumb tacks were found on Portland’s most-popular bridge for biking. In 2011, Seattle-to-Portand riders encountered 4 miles of tacks. One person fell and was taken to the hospital, The Oregonian reported. In Colorado, two men were cited on suspicion of criminal mischief and reckless endangerment after tacks were found on a popular bike route in July. The Westlake Avenue North Cycle Track was not popular with some. Cyclist Chris Sewell picked up a tack riding to work Thursday morning. An officemate had just snagged two tacks Tuesday.